How many times do you use electronic devices on an average day? Nielsen Surveys estimates that the average American adult spends 11 hours each day with some sort of digital media. Worldwide, there are over five billion cellular phone subscriptions, 1.4 billion television sets and 1 billion computers. These statistics prove that people across the globe have not only embraced electronics but are dependent on them. According to the Environmental Protection Agency, the processes used to manufacture electronic devices are energy intensive, water intensive and chemical intensive. The creation of a 0.07 ounce microchip uses 66 pounds of raw materials including water and substances such as flame retardants and chlorinated solvents. Nearly 530 pounds of fossil fuels, 48 pounds of chemicals and 1.5 tons of water are used in the production of one computer monitor. And, electronic equipment is part of an increasing and complicated waste stream that poses challenging environmental management problems. The electronics industry has made some strides toward the creation of more sustainable devices. The amount of power required for high-definition gaming devices, for instance, has decreased by 50 percent since 2006. Computer energy efficiency has doubled every 1.57 years and is expected to continue at that pace for the foreseeable future. Some companies have phased out environmental contaminants such as PVC, phthalates, lead, mercury and arsenic in their products, and they have significantly reduced greenhouse gas emissions and are using renewable energy sources in their production processes. There are still barriers in the sustainable electronics market, though. Certain manufacturers have abandoned the green features of their products in favor of design and cost considerations. Although it has been enacted in the European Union with the Restriction of Hazardous Substances Directive, government legislation on the use of harmful materials in the manufacture of electronic equipment has yet to gain momentum in the United States. The Environmental Design of Electrical Equipment Act was introduced into Congress in 2009 and was intended to regulate the use of certain substances in electrical products. However, the resolution never passed. 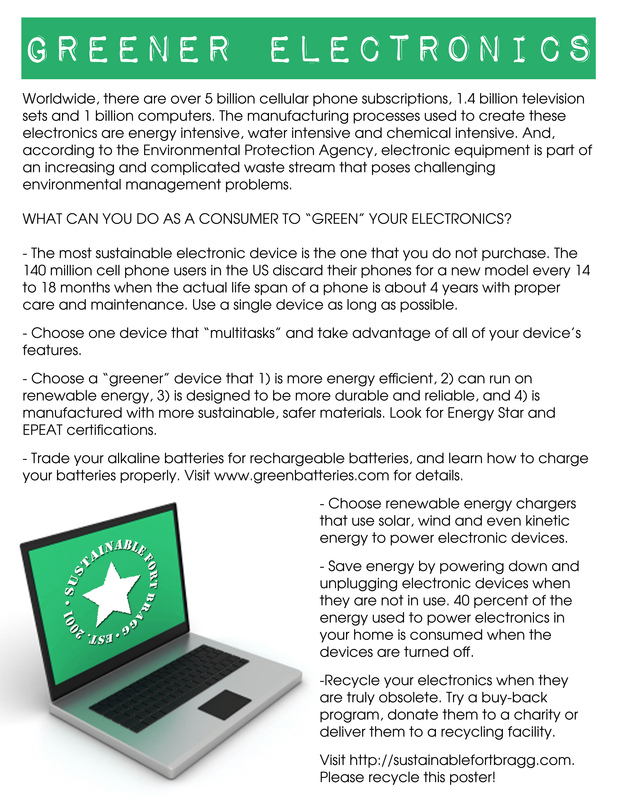 What can you do as a consumer to green your electronics? The most sustainable electronic device is the one that you do not purchase. Electronics retailers are consistently developing and marketing the latest and greatest models of popular devices, so consumers are constantly seduced by upgrades that render products fashionably obsolete before they are practicably obsolete. In fact, the 140 million cellular phone users in the United States own at least two devices and discard their phones for a new model every 14 to 18 months. However, a cellular phone can last for an average of four years with proper care and maintenance. Additionally, there are many versions of similar products on the market. Reduce the costs and wastes associated with electronics by employing all of a single device’s features such as its camera, alarm clock and music player and by refraining from the purchase of multiple products that complete that same tasks. And, use a single device as long as possible. When you purchase an electronic product, consider a used or refurbished item to extend the life of the device and save money. If you must purchase a new electronic item, consider a greener device. Greener electronics are more energy efficient, can run on renewable energy, are designed to be durable and reliable, and are manufactured with more sustainable, safer materials. Avoid the purchase of electronics that contain harmful substances such as lead, mercury, cadmium, hexavalent chromium, polybrominated biphenyls and polybrominated diphenyl ether. These chemicals, often used as solders and flame retardants, present numerous health concerns. Purchase electronics with the Energy Star or EPEAT certification to save energy. In devices that require batteries, trade disposable alkaline batteries for rechargeable batteries, and learn to charge your batteries properly. Lithium ion batteries should be stored with full or partial charges, and the batteries should be used periodically. Nickel metal hydride batteries perform best when they are used on a full drain-full recharge cycle. For more information on proper battery care, visit Green Batteries. Choose renewable energy chargers that use solar, wind and even kinetic energy to power your electronics. Save energy by powering down and unplugging electronic devices when they are not in use. Forty percent of the energy used to power electronics in your home and office is consumed when your devices are turned off. When an electronic device is obsolete, consider a buy-back or trade-in program. Major retailers such as Best Buy and Target as well as Internet sources such as Gazelle, Amazon and NextWorth offer buy-back and trade-in programs. Or, sell your device yourself or donate it to a charity. 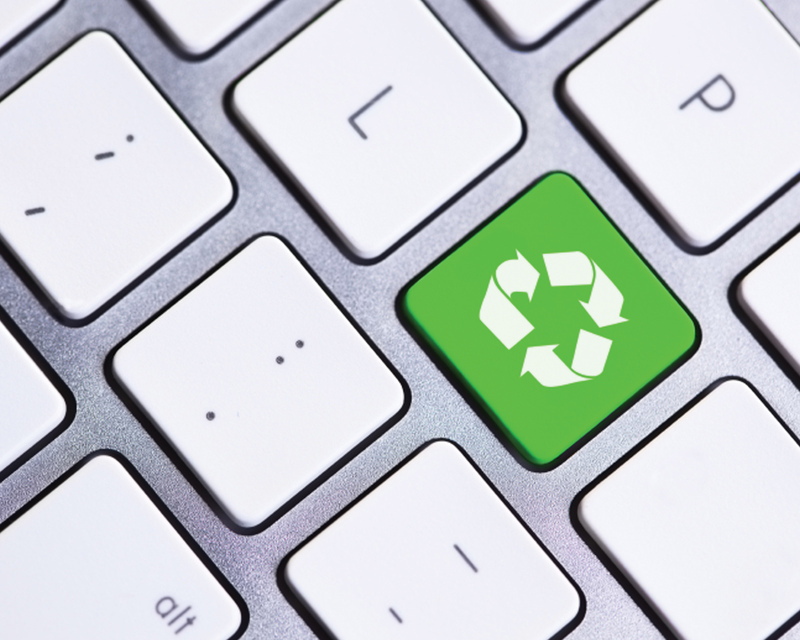 When an electronic device has truly reached the end of its useful life, recycle it. According to Nokia, only three percent of cellular phone users recycle their obsolete phones. Electronic waste recycling is important, though, because electronics contain valuable recyclable materials such as plastic, glass and metal. Electronics also contain chemicals that can leach into the environment if they are not discarded properly. Furthermore, computers and televisions are banned from landfills in North Carolina. 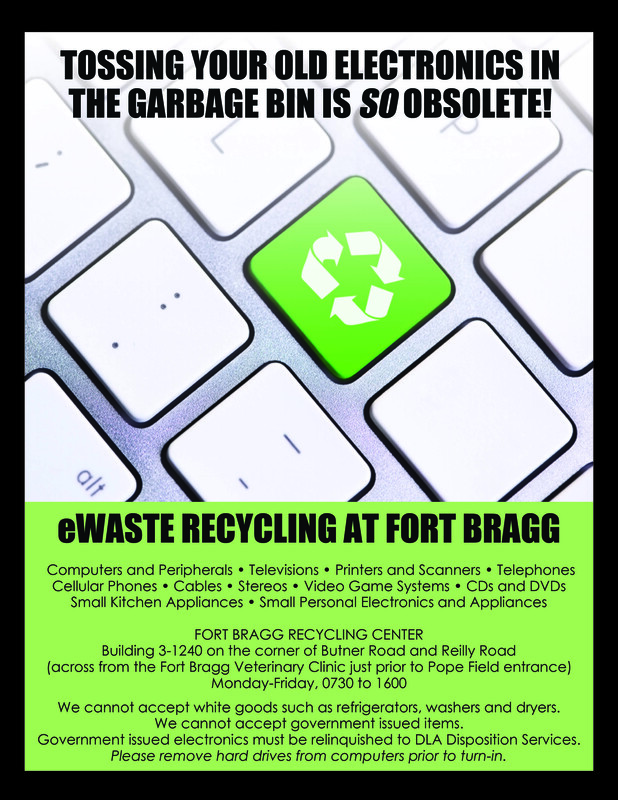 The Fort Bragg Recycling Center accepts personal electronics at the facility in Building 3-1240 on the corner of Butner Road and Reilly Road. For other electronics recycling facilities in North Carolina, visit ECycling Central. SELECT THE IMAGES FOR PRINTABLE POSTERS!